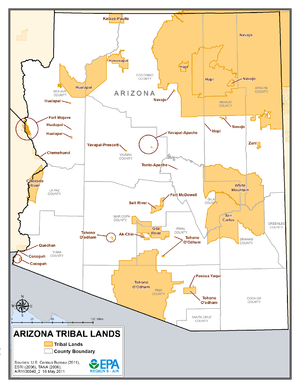 This is a list of Indian reservations in the U.S. state of Arizona. Tohono O'odham Nation Tohono O'odham 1916 10,201 4,446.3 (11,515.9) Pima, Pinal, Maricopa The Tohono O'odham Nation governs four separate pieces of land, including the Tohono O'odham and San Xavier Indian Reservations and the San Lucy district near Gila Bend. Zuni Heaven Reservation Zuni 1984 – 19.5 (50.5) Apache Over 95% of Zuni land is located in New Mexico ( McKinley, Cibola, Catron). Zuni Heaven is primarily a pilgrimage site and has no permanent residents. ^ "2010 Census Data for American Indians". Arizona Commission of Indian Affairs. Archived from the original on 2015-02-18. ^ "Research Protocols" Archived 2015-09-21 at the Wayback Machine, University of Arizona Native Peoples Technical Assistance Office, retrieved 2015-08-23.